Info "Flip him over and reveal this guy's true identity!" 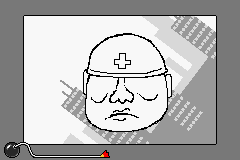 Hat's Off is one of Dr. Crygor's microgames in WarioWare: Twisted! The game's purpose is to flip over the man's head to remove his hat, sunglasses and wig. The accessories change whenever the game's difficulty does. 1st level difficulty: The man's hat must be removed. 2nd level difficulty: The man's hat and his sunglasses must be removed. 3rd level difficulty: The man's hat, his sunglasses and his wig must be removed. This microgame is seen in the third level of the microgame WarioWare: Twisted! in WarioWare: Smooth Moves. This page was last edited on September 26, 2018, at 23:23.